For over 30 years, Sam Militello has been entertaining the heart of childhood as Santa Claus. Sam has enjoyed the chance to visit with thousands of children along the way. A veteran of both print and media appearances, Sam has appeared often in America’s Thanksgiving Day Parade, traveling through the streets of downtown Detroit via sleigh and reindeer. For over a decade Sam assisted with the launching of the Good Fellows annual charity drive, as well as Toys for Tots and other local charities. Through it all he has brought his own unique character to the red suit. 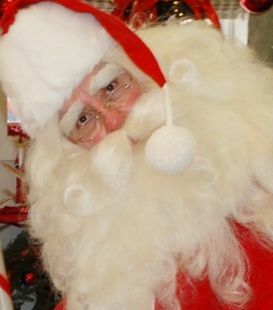 Sam is also the owner of Santa and Co. LLC, which is the producer of the original Santa Claus suit – as designed by Charles W. Howard, made famous by Howard’s Santa Claus School, and continues the tradition from Elizabeth W. Babcock. To date, the suit has been featured in media, print, and on countless Santas around the world. Sam also raises and tours as Santa with his own reindeer.